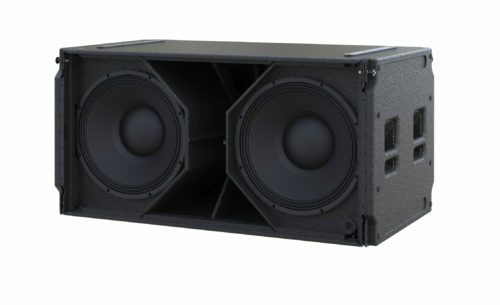 The LR28B is the dedicated low-frequency extension to the LR28 pro-ribbon line-array. It can also be combined with any other Alcons pro-ribbon system, in both permanent and portable applications. The front-loaded system delivers a super accurate bass and sub response with highest output under lowest distortion, due to the super long-stroke 18” woofers. This new-generation transducer is fitted with a large, dual- 4.5” voice-coil Neodymium motor, enabling a significantly-extended excursion*, while maintaining a high sensitivity. Specific attention in this design has been paid to obtain lowest possible distortion. The centrally-located X-Venting™ port design combines further increased output with low power compression. *(not included in SPLpeak spec). Optimal deployment flexibility is guaranteed: The LR28B can be used as single subwoofer or in multiples; As end-fire or cardioid array; Together with LR28 or in separate sub-only arrays. All functionality is possible in stacked or flown configurations. Rated for a high WorkingLoadLimit with 1:10 safety ratio, the versatile rigging system, with front and rear splaying possibility, enables straight or pre-curved flown (cardioid) arrays, to be flown besides or behind an LR28 array. Array configurations can be simulated through the LR28 GLL in the Alcons Ribbon Calculator (ARC), Alcons’ high-resolution 3D simulation program (soon to be released). Mobile (cardioid) stacks of up to 3 units can be transported through the PRRGLR28B pre-rig, including stack-specific softcover. For full system performance, the LR28B is to be driven and controlled by the ALC amplified loudspeaker controller; Driven by the ALC, the LR28B delivers full operation flexibility, maximum sound quality and output power with long-term operation reliability. The Signal Integrity Sensing™ pre-wiring ensures complete cable/connector compensation between the LR28B and ALC, significantly increasing response accuracy and reducing both linear and non-linear distortion to an absolute minimum, regardless of cable length and system impedance.